Who doesn't just love the Gecko? This collar features brightly colored geckos lined up head to tail on a deep yellow background. Stitched to super strong royal blue nylon webbing. Beautiful and strong streamlined solid cast aluminum side release buckle in a beautiful satin finish. Matching leads available in 4', 5' or 6' lengths. Personalized with up to 4 lines laser engraved text on the buckle with a maximum of 15 characters per line. Custom engraved with whatever text and font you choose! Please measure carefully. This item is custom made to order and is not eligible for return/exchange. Please allow up to 2 weeks for delivery. personalized dog collar, ribbon, awesome, bright colors, colorful, sunny, deep yellow, sunset yellow, multi-color, sapphire blue webbing, orange border, hot, tropical, tropics, summer, warm colours, animals gecko pattern, distinctive, stylish, distinguished, male (masculine, for a boy dog), female (feminin, for a girl dog), pretty, designer fabric, cloth, design, handmade in the US, custom, handcrafted, personalizable, cotton, nylon, dog collar and leash set, adjustable collar and lead, custom engraved buckle, non-leather, latest fashion, fashionable, decorative, strong, durable, tough, for medium dogs, for big dog breeds, and for xxl giant dogs...! 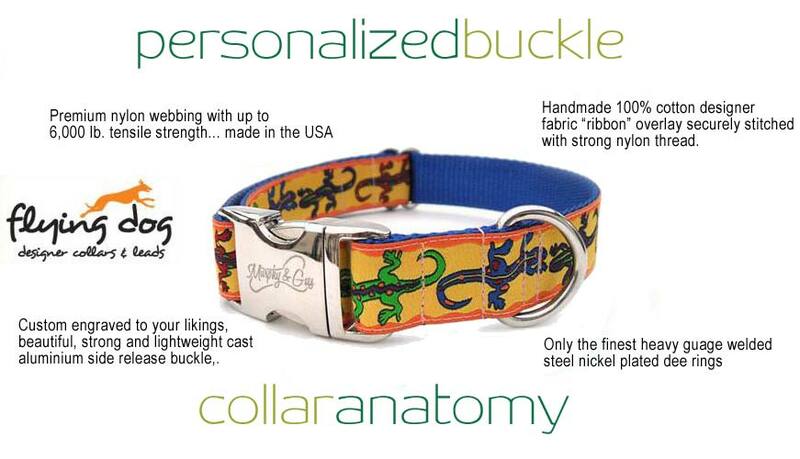 Personalized Buckle Dog Collar "Gecko" by Flying Dog Collars, Anatomy of a Dog Collar. Buy online in the dog collar store: flying dog collars, designer dog collars, ribbon and nylon dog collars, handmade designer dog collar & leash sets from Flying Dog Collars; Made in the USA. Handmade Designer Dog Collar with custom engraved buckle to personalize it with your dog's name and your address, phone number, ID info. 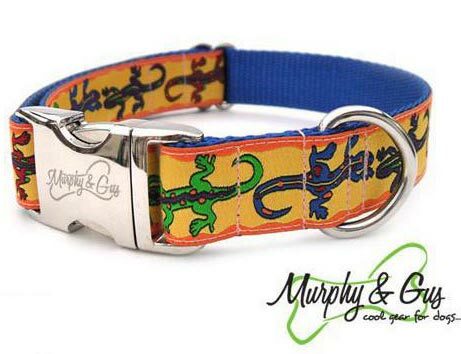 Colorful gecko print in blue and green on a yellow nylon dog collar, with blue webbing. Flying Dog Collars, Murphy and Gus. 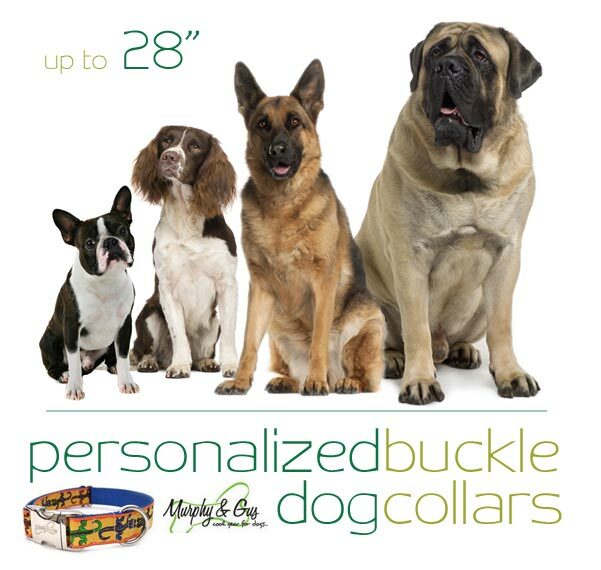 For medium, large and extra large dogs, up to neck size 28 inches! for big dog breeds, and for xxl giant dogs...!
. Designer dog collars and leashes, personalized dog collars and leads. Small/Medium dog collar (SM), large dog collar (L), extra large dog collar (xl, xxl). Available Neck Sizes in inches: 13 inch, 14 inch, 15 inch, 16 inch, 17 inch, 18 inch, 19 inch, 20 inch, 21 inch, 22 inch, 23 inch, 24 inch, 25 inch, 26 inch, 27 inch, and 28 inch.